Non-porous Proteomix Ion-exchange Phases – High Resolution and High Capacity Proteomix ion-exchange phases have been innovatively developed for achieving high ion-exchange capacity, a breakthrough technology for non-porous resins. Proteomix packing support is composed of a rigid, spherical, highly cross-linked poly(styrene divinylbenzene) (PS/DVB) non-porous bead with the particle size selections of 1, 1.7, 3, 5 and 10 µm. The PS/DVB resin surface is grafted with a highly hydrophilic, neutral polymer thin layer with the thickness in the range of nanometer. The hydrophobic PS/DVB resin surface is totally covered by such a hydrophilic coating that eliminates non-specific bindings with biological analytes, leading to high efficiency and high recovery separations for biological molecules. On the top of the hydrophilic layer, ion-exchange functional groups are attached via a proprietary chemistry, resulting in high capacity ion-exchange layer. The uniqueness of non-porous Proteomix ion-exchange phases is that they combine increased capacity and resolution with their intrinsic advantages of high efficiency and high separation speed. Proteomics ion-exchange phases are especially suitable for high resolution, high efficiency and high recovery separations of proteins, oligonucleotides, peptides, polysaccharides, cell lysates, nanoparticles and nanotubes. 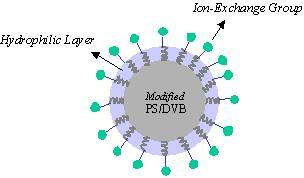 Porous Proteomix Ion-exchange Phases – Porous Proteomix packing support is composed of a rigid, spherical, highly cross-linked poly(styrene divinylbenzene) (PS/DVB) particle with a pore size of 500 Å. The surface is grafted with a highly hydrophilic, neutral polymer thin layer, and further chemically bonded with a layer of ion-exchange functional groups. Four ion-exchange phases (SCX, WCX, SAX and WAX) are specially designed for high capacity and high recovery separations of proteins, oligonucleotides, carbohydrates, and peptides. The porous Proteomix resins have particle size of 5 and 10 µm for analytical separation, and 30 and 50 µm for preparative separation. The chemical structure of Proteomix ion-exchange phases is composed of a rigid PS/DVB core, a densely packed, nanometer thick, hydrophilic coating, and a uniform ion-exchange layer, as shown in Figure 1. 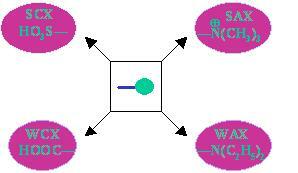 As shown in Figure 2, Proteomix ion-exchange phases are composed of SCX, WCX, SAX, and WAX. The Proteomix SCX phase is a strong cation exchanger with sulfonate functional groups chemically bonded to the top of the hydrophilic coating for both porous and non-porous PS/DVB resins. The Proteomix WCX phase is a weak cation exchanger with carboxylate functional groups chemically bonded to the top of the hydrophilic coating for both porous and non-porous PS/DVB resins. The Proteomix SAX phase is a strong anion exchanger with quaternary ammonium functional groups chemically bonded to the top of the hydrophilic coating for both porous and non-porous PS/DVB resins. The Proteomix WAX phase is a weak anion exchanger with tertiary amine functional groups chemically bonded to the top of the hydrophilic coating for both porous and non-porous PS/DVB resins.